Reiner Gonzalez of Miami just made his third GM norm at the Banyolos Chess Festival (August 16-24) in Spain. Reiner did not prepare much for his Spanish tour in America because he was busy coaching and running his company, Professional Chess Servies. Once he was in Spain, he was able to relax and prepare for the games. In his first try at the Badalona Open (August 2-10), he missed a GM norm by half a point with 6.5/9. Reiner travelled to the Sants Open in Barcelona, August 24-Sept 2 immediately after the conculsion of Banyolos. He has barely had time for the result to sink in, although he plans to celebrate tonight. With this result, Reiner follows very closely in the footsteps of Jesse Kraai and Vinay Bhat, who also earned their third norms this year. At 34 years old, Reiner's career trajectory has much in common with Jesse's, who is also 34. Read the Chess Life Magazine interview with Kraai. The two definitely prove that you don't have to be underage to improve at chess! Reiner raved about the conditions in Banyolos, a beautiful town with a lake in the middle. Explaining his success in Banyolos, Reiner said, "I think the main factor was the small city in which the tournament took place. I normally do better in this kind of place. 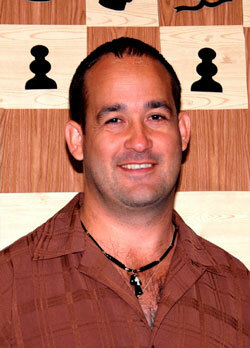 I earned by 2nd GM norm in Lindsborg, Kansas because of having nothing to do but studying chess." Gonzalez's favorite game from his tournament was a victory on the Black side of the Scandinavian against IM Jordi Fluvia. CLO will update this article with that game as soon as possible. "I find it interesting that all the games I had to win for norms I won as Black." Gonzalez told CLO: " I am really thankful of my chess team, Miami Dade College (MDC), since they gave me the possibility of coming here to get my last norm. I also want to thank all the chess fans and players for their support. It was really helpful in Las Vegas at the National Open. Soon they will see some of my games from this trip!"